Too much chocolate? What do you think? I swear to god my jeans just popped open when I looked at this picture! Was speedily eaten. I have to admit, it did taste nice. Now THAT looks amazing. Is there any left? Ahhh, we finished it last night !!!!! I agree with the other posters…you certainly can NEVER EVER have too much chocolate! Thanks for the inspiration, next time I make a cheesecake I will put some melted chocolate ontop. It certainly made the cheesecake popular with the kids. 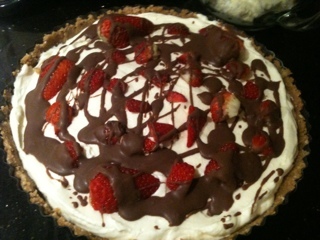 The Strawberries and choc was a good mix. You can NEVER have too much chocolate. You know?